Nata Putra Muay Thai is at the rear of Nata Putra Hotel. The hotel is seemingly abandoned. Its car park is used for patrons who visit the nearby ATMs and fruit juice stall. There is a clothing stall on one side of the entrance to the hotel; the clothes are new and arranged neatly, but, there are few customers. A man sits behind the counter checking his mobile phone, perhaps updating his Facebook status. He doesn’t seem to be expecting customers. In a general space of the hotel, a man watches a television; chairs and tables are scattered and unused. One walks up a flight of stairs to get to the gym. A mural of a muay Thai fighter wearing the appropriate headgear, photographs of gyms in Thailand and a cabinet full of Fairtex gloves, shorts, hand-wraps and t-shirts mark the space as belonging to the realm of muay Thai. In contrast to the age of the hotel, the gym space is clean and new. The gym is a variation on the standard requirements for muay Thai or boxing training: a ring, punching bags, and an empty space with a padded floor on which to warm up. This simple infrastructure belies the rigours and complexity of muay Thai technique and the difficulty of its mastery. While watching professional muay Thai fighters, one is struck by its simplicity and easy rhythm. Fighters almost walk around the ring, with the front legs bouncing at a steady pace before launching a volley of kicks, punches and elbows. But, to reach that level of articulation and consistency of style one must repeat and inculcate the correct technique into one’s muscles. While sparring, let alone fighting, one doesn’t have time to think of how to perform the correct technique: it must come automatically. One can’t think of what one has to do; one needs time to consider how to respond to the movements and techniques of the other. And just as there is a consistency to the equipment and infrastructure of a muay Thai gym, so is there a consistency in the kind of training one does whether the gym be in Thailand, Indonesia, the Netherlands or Australia. Variations of intensity and emphasis no doubt exist, but, there are many ingredients that must not be excluded. Warming up may take as long as 40 minutes to an hour. This may consist of running, skipping, sit ups, push ups and various strengthening exercises. Prior to the end of the warm up, the practitioners or muay thai are already covered in sweat and reaching regularly for water bottles and towels. Training in the Netherlands involves a lot of partner work – doing techniques against one another. At Nata Putra much emphasis is put on repeating and mirroring the correct technique as exemplified by the instructor. Skipping – an essential of warming up – helps boost endurance and to speed up the reflexes of the muscles in the hips. It boosts co-ordination; necessary in order to react quickly during sparring. It is a standard, basic activity that gets one’s body into proportion, refining the muscles in the legs, chest and arms. Those new to the training display their effort in maintaining it for three times three minute rounds, those who are used to the training, barely break a sweat and perform it casually; as if walking. It’s an effortless act in warming up; heating up the body, turning the body on. Muay Thai is violent no doubt: during bouts, fighters are often knocked out or end up bloodied and bruised. Its violence, however, belies the subtlety of its techniques and indeed the effort that is required to achieve consistency. Fighters of relatively light weight 55kg – 60kg are able to punch, kick, knee and elbow with a force beyond their frame, as long as the technique is performed correctly. This is a play of physics with the intuition and knowledge of the fighter. One must have the lightness of foot as a dancer, yet the mindset of someone who is striving to stay alive; to protect one’s head, protect one’s torso. The violence of muay Thai is mediated in training. Students at Nata Putra Muay Thai learn some of the skills of the sport without putting themselves at risk. The techniques of muay Thai are to be used in the ring only. A code of conduct is expected of boxers: the ethics is simple; it should not be used against those who are untrained or unable to defend themselves. 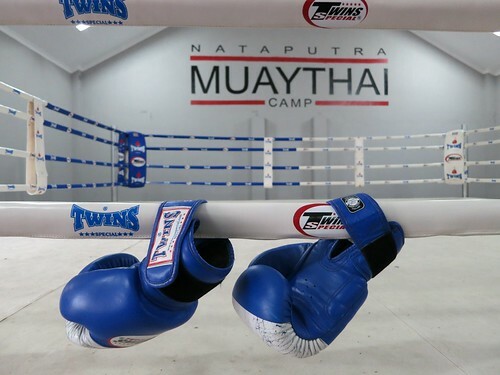 The techniques of muay Thai can be performed against those of equal ability and who willingly participate in the art of muay Thai, through a structured session of sparring or fighting within a ring. Fighting and sparring rests on an agreement between those involved. ‘Okay. Have you done your stretching? Okay. Run for ten minutes, skipping for three times three minutes and then three rounds of shadow boxing.’ And so begins a training session with Fouad. There are no formalities; no introductions – just straight into training. While training, Fouad completes his ritual prayers, changes into his muay Thai shorts and t-shirt, does some skipping, stretching and lifts some weights. He’s about 175cm tall and weighs about 70kg. This is quite heavy for a muay Thai fighter. Fouad says he spent years doing tapak suci. And then, in his later teenage years he switched to kickboxing. From kickboxing he switched to muay Thai. 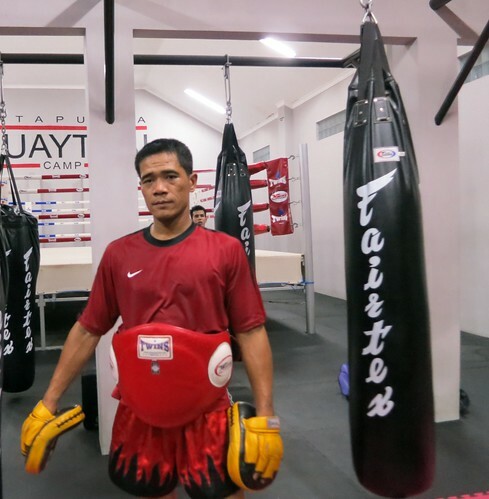 He studied muay Thai in Yogyakarta with an instructor from Thailand who spent several years in Indonesia. It was at this time that he met Pak Sigit, a professional boxer from Semarang. Fouad and Sigit made the switches from their previous disciplines to muay Thai. As a relatively new fighting sport in Indonesia, muay Thai is the meeting point for martial artists and fighters from other genres – whether they be boxing, karate or wushu. The network is small and most trainers know each other. Fouad was in Malaysia for a fight from which he emerged victorious. He is currently preparing for the SEA Games to be held in Myanmar later this year. This is an amateur fight – meaning the fighters wear shin and head guards. Fouad trains his student with unrelenting demands. During pad work, Fouad beats out his instructions rhythmically: jab, jab, jab-cross, jab-cross-hook. Kick! Kick! Knee! Elbow. Elbow. It’s only three minutes per round, but, for the student it is endless. The student’s t-shirt is soaked; beads of sweat bounce of the pads with each punch, each kick. The pain and exhaustion of the student induced by Fouad’s attention to detail, belies Fouad’s gentle and polite demeanour. Pak Sigit is in his late 30s and has apparently hung up the gloves, as they say. He is the head coach at Nata Putra, also instructs at Medan Jaya and is Fouad’s coach. The two laugh easily, share old and ongoing jokes. They are a similar height and weight, which probably aids training regimes. Pak Sigit’s shins are bent. There are scars and seemingly permanent bruises. His torso is free of fat. He works from 6am as a security guard at a car dealership during the day and in the evening he goes straight to either Nata Putra or Medan Jaya. Indeed, on a salary of Rp.1.5 million per month, one must work at extra jobs in order to provide for a wife and three children. There must be stresses, no doubt: but Sigit maintains a persistent smile. His body language is tough; but his manner, his patience and punctuality speaks of his hardworking ethic. The cleanliness and newness of the Nata Putra Muay Thai gym appears incongruously with the decline of the Nata Putra Hotel. Students from nearby universities attend the beginners and general classes with both a sense of curiosity about what this muay Thai thing is as well as willingness to develop their fitness and techniques. Students assert their varying levels of commitment to the gym; some coming before the class starts to warm up by themselves. Some wear muay Thai paraphernalia; others are dressed in casual t-shirts and shorts. 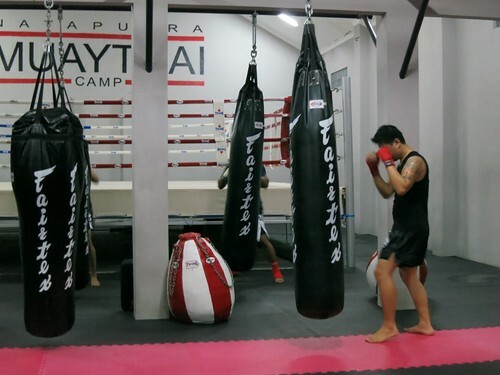 Muay Thai at Nata Putra is informal and relaxed. Students progress at their own pace. Some take it to a more intense level of heavy sparring and potential amateur fights. The sport is available for purely fitness ends – students don’t need to engage in sparring, if they don’t want to. In such a case, muay Thai may lose some elements of its violence, its risk for imposing injury on one another. This shows the sport’s flexibility. The users of this bodily practice determine its degree of violence. Andy Fuller is a researcher currently based in Yogyakarta. His main interests are urban studies and popular culture.